Beyond those boundless white clouds, I will make my attack with a calm feeling. Not even thoughts of life and death will come to mind. A person dies once. It will be an honorable day to live for an eternal cause. Ogawa's life story is told in detail in Danger's Hour: The Story of the USS Bunker Hill and the Kamikaze Pilot Who Crippled Her (2008) by Maxwell Taylor Kennedy. Ogawa was from Gunma Prefecture and attended Waseda University in Tōkyō. In the fall of 1943, he was drafted along with other liberal arts students from top universities. He entered the 14th Class of Naval Flight Reserve Students and received basic training at Takeyama Base near Yokosuka and flight training at air bases at Tsuchiura and Yatabe in Ibaraki Prefecture. 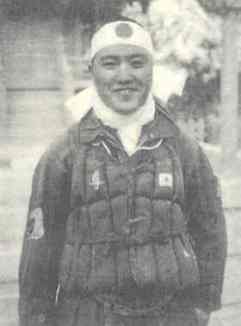 He became part of the Kamikaze Special Attack Corps 7th Shōwa Squadron that made a sortie from Kanoya Air Base in southern Kyūshū on May 11, 1945. Ogawa piloted the second bomb-carrying Zero fighter that crashed into Bunker Hill. This kamikaze attack killed 393 and wounded 264, more casualties than those inflicted by any other Japanese suicide attack. The identity of Kiyoshi Ogawa as the pilot of the second Zero fighter to hit Bunker Hill was determined from items taken from his remains by Robert Schock, a Bunker Hill crewman. Schock took the following items: name tag with the Japanese characters "kawa shōi" (Ensign ----kawa) visible, two pieces of letter paper filled with Japanese characters, broken aviator watch, and two photographs . When Schock passed away, his grandson, Dax Berg, found Ogawa's possessions stored away in a box. The name tag, along with the date and time of the kamikaze attack on Bunker Hill, turned out to be the key to identification of Ogawa as the pilot. In March 2001, Ogawa's grandniece and her mother visited San Francisco to receive his items from Berg. 1. The original Japanese letter was published in Yasukuni Jinja 1999, 105-6. Susaki, Katsuya. 2004. Kamikaze no shinjitsu: Tokkōtai wa tero dewa nai (Kamikaze truth: Special attack corps is not terror). Tōkyō: Kōjinsha. Yasukuni Jinja, ed. 1999. Eirei no koto no ha (5) (Words of the spirits of war heroes, Volume 5), pp. 105-6. Tōkyō: Yasukuni Jinja Shamusho.